The Purple Martin Conservation Associations online forum is a virtual treasure trove of material for me at times. I simply love the back and forth banter of many of the different forums that I am a member of. Today Courtney asked what she should tell her neighbors who may ask about the repeating nest trap in the backyard. It is a fabulous question! It is a hard pill for many to take- that the European Starlings and English House Sparrows that we catch are usually euthanized. People like things in a tidy, neat, hermetically sealed container. Like the chicken in the supermarket. I mean really, how many of us would become vegetarians if we had to kill a chicken ourselves? Well, I would ask my husband to do it but not everyone would go through the very real and gruesome task. What about beef and pork? I know that would definitely be off our menu-husband or not. SO why do people get so upset about S&S/sparrows and starlings? It is a difficult question. You can take 2 approaches when the question comes up. You can be honest and make enemies (sometimes) or give a neat, tidy, hermetically sealed answer and walk away laughing every time. Worst case scenario is the neighbors will think you are a little weird. On a serious note. Todays nest check was postponed due to afternoon thunder storms. We look forward to a nest check tomorrow and the restarting of the nestcam in a nest with eggs!!!! Nest Check and Check THIS out! Yesterday was another nest check here at my humble Purple Martin Colony. As of now I have 19 gourds offered and 6 house compartments. I am awaiting a shipment of a half dozen gourds to fill my new rack that has only 5 gourds on it at this time. I do believe there are birds sleeping in every compartment INCLUDING gourd #4 which has the nest cam. As you may remember, the nest cam was online briefly but the infrared light spooked the pair that was in the gourd out to another. The gourd has been the subject of a lot of attention from an ASY pair. Though hesitant for a few days, the pair does appear to be spending a lot of time in and out of the gourd. But before I get carried away with details, here are the results of the nest check. The exact numbers so far. All Troyer horizontal tunneled (SREH) gourds and all ASY pairs. On the next nest check which should be on Tuesday, I will switch the nestcam to gourd #11. If there are more eggs in that nest (which I don’t see why there would not be) I will change the camera over to that gourd. Be on the look out for that. The SY males are causing quite the ruckus and I do believe there may be a shortage of rooms. On several nights I have seen a Purple Martin sleeping on the porch of the Sunset Inn Aluminum house. At first I thought it may be the same male that slept on the porch all season last year. But a few nights ago it was NOT a male but a female or perhaps a SY male on the same porch. Could it be that there are no vacancies and the porch is all that is left? Could it be a fool hardy martin enjoying the outdoor breeze? I am not sure but trust me when I express my worry over these birds. All hours of the night I hear them chirping. At 3 AM I have been hearing a male singing in one of the gourds in pitch black. Are they crazy? I know the waterfall on the pool is running all night to mask their noise but I will soon turn on the radio outside to mask their chattering. Why don’t they just hang a free dinner sign? On a side note; I wanted to announce the return of feather art to our site. 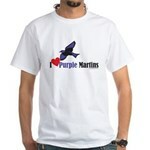 www.PurpleMartins-R-Us.com. 3 gorgeous pieces of handpainted feather art. They are signed and numbered by the artist, D.L.Miller. I requested that these 3 pieces be very different and I do believe they are outstanding. So until Tuesday, keep an eye out for hawks and keep it Purple! Purple Martins are the most intriguing of birds. I often say that they are the most common of unknown birds. What do I mean by that? Well, by that I mean that most people I meet have NO idea what a Purple Martin is. But yet my backyard is full of 30 or so Purple Martins as i speak. How can this be? How can a bird that is so numerous be so illusive to the common man? Unless a person has a neighbor with a Purple Martin house up or grew up around someone that had a purple martin house up, they just would never get the chance to see a purple martin. That is unless they go to a place such as Green Cay Nature Center and see first hand the spectacle of dozens of birds flying in and out of a Martin condo”. Many of these people go on to find out about how they can attract purple martins to nest in their own backyards. 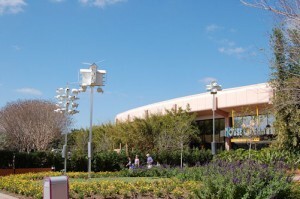 Centers such as these provide a great service to these birds. These preserves can educate and show how a natural habitat helps us all. How preserving our environment can leave a lasting legacy to our children but other than the knowledge they impart and the pictures that are taken, the center remains where it is and the people go home. Purple Martins at these centers, on the other hand, give some visitors a chance to recreate a portion of the natural environment in their own backyard. A piece of conservationism that lives on season after season bringing song and exposure to a American tradition that has endured since our arrival to this continent. Today a gift of safety and security was given to the Purple Martins of Green Cay Nature Center. Through a kind and generous donation by Carl Updike of Rehaboth Beach, Delaware, the 3 Purple Martin houses and the 1 gourd rack will all now be protected by Aluminum Predator Pole Guards. Pole Guards are the front line defense against snakes, raccoons and other ground predators that CAN easily climb any pole. Though many people leave their poles unprotected and are lucky to escape any problems, the devastation that 1 snake can cause can mean the loss of a colony. In a setting such as Green Cay where snakes and raccoons are welcome sights and common place, having purple martin predator guards can make a huge impact. Not only for the safety of the birds but as a simple educational tool that many people can see these devices in place and in use and come to understand the nessecity of predator protection in their own backyards. Mr.Updike, the Purple Martins, Green Cay Nature Center and I thank you. Green Cay Nature Center, congratulations on having a fan like Mr.Updike. Nest Check: We Have EGGS! This wasn’t really the first nest check of the season but it was the first with eggs. I guess until there are eggs I don’t really count them as nest checks. But today the games begin! 3 nests have a grand total of 5 eggs. 5 beautiful white precious jewels holding the tiny little mass of yolk and albumin that is awaiting the warmth only a mother Purple Martin can bring. They are sitting and patiently awaiting to be joined by brothers and sisters, waiting for the gentle touch of their mothers brood patch. SY Purple Martins in the mix! 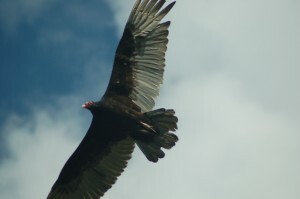 OK, March 20 and I FINALLY have seen SY Males at the colony here at www.PurpleMartins-R-Us.com. Of course they are on the webcam and hopefully one of these SY’s will take up residence in the nestcam. The nestcam is on gourd #4 but the appearance of the camera was enough to spook the ASY pair out of that gourd. My bad. I should have waited till eggs appeared but I was eager and the pair went straight to the new gourd rack I put up-so no real harm done. Back to the SY (sub adult or under 2 year old) Purple Martins. I had suspected quite a few SY females but I was hesitant to actually say there were SY’s here without seeing the unmistakable coloring of the SY male. Lets refresh! As we all know, only the ASY or After Second Year Purple Martin bears the all over steely blue coloration. It always makes me wonder exactly why they called them “Purple” in the first place. It drives me crazy as an artist. If I paint them blue people will say, “That ain’t no PurpleMartin-It’s BLUE!” But if I paint them purple others will say, “It aint no Purple Martin, cause they are blue!” So the insecure person in me wants to please. What can I say… ANYWAY!!! All other purple martins are frustratingly similar to the untrained eye. Don’t fret. I will give you some tips. Take the SY male, for example. He has survived only 1 migration and this is his first trip back to the colony since he was born. He has undergone 1 molt in Brazil and he returns with some of the purple/blue feathers but will not be considered a true adult until his second trip back. He has a mottled appearance and ranges from only a few purple/blue breast feathers to large blotches. He is often confused with females which also have the brown/grey breast, belly and undertail coverts, or as the area is called the crissum. Remember that name, crissum, there will be a test. Ages in Purple Martin females is agonizing for me and without a good look at that undertail area or crissum, you can be hard-pressed to tell the difference in ages. The younger, SY, birds will tend to be a brown color above. The ASY females will have more of that steely blue color on the shoulders, top of the head and back. Underneath on the breast will be the brownish/grey. The color will sometimes make the feathers look like scales. Under the tail (below the vent) in the area called the crissum is the real difference. Notice that scale look on her undertail coverts (crissum)? That is tell tale of an older female. Purple Martin Nest Cam is ONLINE! Don’t get me wrong. My excitement is tempered with a healthy dose of reality. The nestcam is using mogulus.com (thank you tech support) and the birdcam is using Ustream.tv. I welcome any and all feedback on which you like better. Both insert the most annoying ads that I do NOT profit from. So please, no hate mail. The weight of the camera housing makes the gourd list to the side a bit but not too bad. Gourd #4 was the winner of the online poll to determine which gourd would get the camera first. The Nestcam seems to kick off a bit more frequently which requires me to focus a fair bit of my OCD tendencies to checking the 2 spare computers Internet connection. My husband is at the end of his patience…I think. I only know I would be. I am sure he wonders when he will get me back from the birds and is counting the days until the season is over. This has been a very busy year. Between the websites and all that entails and my outreach efforts, I have been talking, thinking, and breathing purple. I don’t know if I mentioned the Purple Martin presentation I gave at Green Cay Nature Center a few weeks ago. There were some 20 + people there and many questions were asked. I brought a selection of gourds and tried to “make some converts”. I have also been sending out flyer’s to local residences that have purple martin houses in their backyards. My martins appear very happy and are quite loud. The pool water feature runs 24/7 to mask any noise that may attract Owls. We added the sheet metal to the pine tree under the Owls nest box and hope that helps to keep them safe from raccoons. But back to the martins, I need to hang more gourds to accommodate the birds that have yet to arrive. I still have yet to see a SY. On today’s nest check I noticed that most of the gourds had either pine bark or leaves brought in and all seem used. Spotless clean of course but all but 1 or 2 have perfectly shaped nest bowls swirled like soft serve ice cream. I hope you all enjoy the nest cam and bird cam and let me know what you think. Oh the joys of Purple Martin stewardship! I recently was undergoing turmoil over a decision to add more housing this year or wait until next year. My husband’s gift to me of a Gourd Rack made my decision for me. When I saw the boxes in the garage I tore them open with a glorious glow about me that few people have seen. I held the shiny steel in my hands and reveled in the beauty of it. I immediately set to digging a very large deep hole in which to set the ground stake. The Ecstasy was soon to end. For those that do not know a ground stake is a long piece of metal that is concreted in the ground with a portion of this stake sticking up out of the ground. The Purple Martin pole is then slid down over it allowing easy removal at the end of the season. Some people use a ground sleeve which is concreted in the ground first (flush with the ground) then the stake is inserted into the sleeve. This allows complete removal of the pole AND the stake so that only a concreted hole remains. Well, here I am digging this hole to China. I am almost done and just trying to scoop out the last few chunks of dirt out of the bottom. I had battled the rock hard dirt and could taste victory. I recalled my U.S. Army days and knew that when my husband came out to “help” he would see this hole and be amazed at my hole digging prowess. I would look at him, non plussed, and simply state that this was nothing compared to digging fox holes in 20 degree weather. But alas, disaster struck. In the last thrust of the shovel I felt, what I thought, was a sword ripping into my back. A red hot poker in my lumbar area of my spine. A half grunt-half whimper escaped my lips and I froze in absolute Agony. I held on to the shovel for dear life. I would not give my neighbors the satisfaction of laughing at the crazy bird lady with a broken back. I slowly, slowly righted myself up. Holding back as waves of nausea washed over me like an old friend. My husband came out and took over and the concrete has dried and the pole is up. I did not wait the 2 days (as I should have) for the concrete to cure. I know, I know…I loaded 4 gourds on the rack and filled 3 of them with pine needles and 1 with cut up pieces of dried palm fronds (Thanks Joe!) and hoisted them effortlessly in the air as the sun set. The Martins descended as I walked to the house and as I turned around no fewer than 10 martins were sitting on the new rack looking it over. I am almost certain that I have a full house with all 21 compartments being occupied. Mostly with pairs. Even the gourd on the Shepard’s hook is occupied by a ASY male. I noticed a few nights ago a male sleeping on the outside porch of the Sunset Inn house. I am curious as to whether or not this is the same male that slept outside all season last year. It also could be that this male could not find an empty room and was in need of somewhere to sleep. I hope he finds a home in one of the new gourds. As I had mentioned, I filled one gourd with cut up palm fronds. This was from a suggestion that Jose “Joe” Pellegrino, an elderly gentleman had told me about. He was a landlord in the Belle Glade area for many years. He told me he would cut up these dried palm fronds that had fallen off the trees in 3-4 inch sections, and use those as nest material. I am curious to see how they hold up. I will monitor and document what I find. On another note, we went to Disney World AGAIN, this past weekend. We had to use up the tickets as they were to expire. 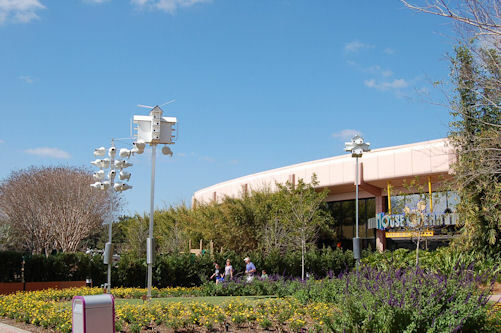 This time we went to Epcot and I went to visit the Purple Martin Colony there. I saw about 10 Martins flying about and one dove in the T-14, another in a Troyer gourd but I was unable to photograph the birds. But the site is just as spectacular as I remembered. And NO sparrows!